With Valentine’s Day occurring recently it may be apt to recount the story of a nineteenth century Royal visit to RBGE, and tell the stories behind two red roses named in honour of the visitors. From the visit in October 1861 of Queen Victoria and Prince Albert until the present time, many members of the British Royal Family have made official and semi-official visits to the Garden. In the summer of 1881, Victoria and Albert’s second son, H.R.H. Prince Alfred, Duke of Edinburgh visited RBGE on two separate occasions. The first visit was on the 26th July, the day he officially opened new docks at Leith. Prince Alfred planted a commemorative tree, a Quercus conferta (Hungarian oak) to mark his visit. This species is now known as Quercus frainetto. The second visit, accompanied by the Duchess of Edinburgh, was exactly a month later. The Duchess was Maria Alexandrovna the daughter of Tsar Alexander II of Russia. Her marriage to Prince Alfred took place in the Imperial Chapel of the Winter Palace in St. Petersburg on 23 January 1874. You can view a painting of the occasion on the Royal Collections website. The Duke and Duchess were visiting Scotland in a party of the Royal Family headed by Queen Victoria. They visited RBGE on their last day in Edinburgh, before heading on to Dundee. The carriage conveying the royal visitors arrived at the Garden at 12.30 and they were met by Professor Alexander Dickson, Regius Keeper, Emeritus-Professor John Hutton Balfour, Regius Keeper from 1845-1879, and John Sadler, Curator. Having received prior notification of a royal visit a site had been prepared to receive a commemorative tree, and a young birch tree selected. The Duchess performed the tree planting ceremony. Having filled in a few spadefuls of soil, she asked Mr Sadler if that was sufficient. Sadler replied that it would require more soil if the tree was to live. The Duchess smilingly replied, ‘A little more?’ and added another two spadefuls. Tree duly planted, the party proceeded to what a contemporary news report calls ‘the new class-room.’ This building is now known as the RBGE Lecture Theatre. And the roses… Well, all plant breeders like to catch contemporary events by naming new cultivars after current personalities or events. Specialist rose growers still supply the cultivar. Unfortunately no copyright free colour image of this rose has been found in the Library collections here at RBGE. Here is a monochrome image which appeared in The Garden in 1888. 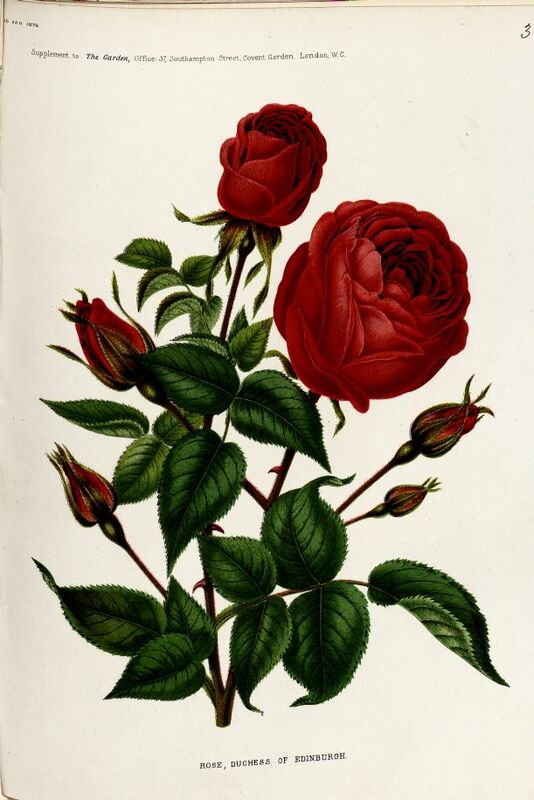 A colour plate of this rose was featured in Paul Hariot’s Le livre d’or des roses: Iconographie, histoire et culture de la rose (1903). This is a work that we do not hold at RBGE. The one sent out by Dunand, raised by Schwartz, was not considered valuable. The other cultivar, raised by Nabonnand, with Rosa ‘Souvenir de David d’Angers’ as one of its parents, was much more favourably received. This rose was sent out by leading UK nurserymen Veitch & Son. 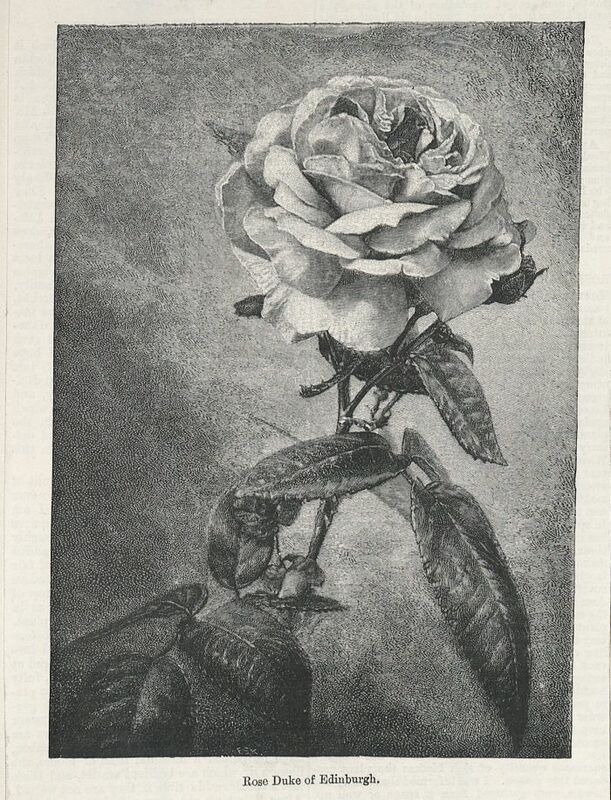 Although promoted in horticultural journals at the time, see colour image below, this rose drops out of guides to rose growing around 1900. Clematis ‘Duchess of Edinburgh’ on the other hand, also named in honour of Maria, Duchess of Edinburgh, is a garden plant that is still available to-day. And in case you are wondering if the Prince-Duke and the Duchess lived happily ever after, that’s another story, and a tragic one in places. Images sourced in RBGE Library Illustrations Files and Periodicals Collection.